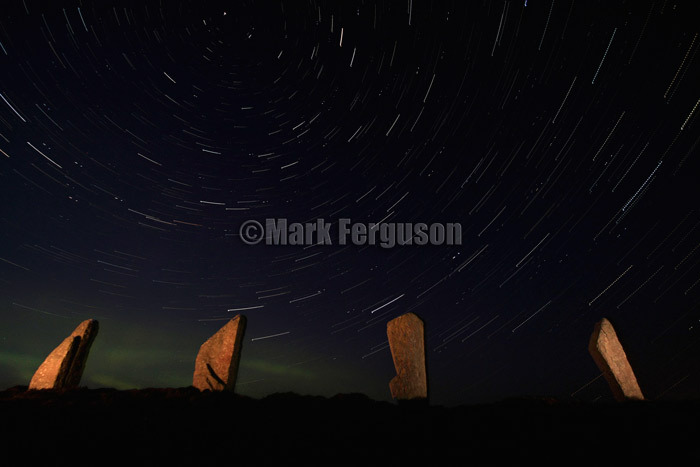 Advances in digital camera technology have tempted me to experiment with astrophotography; and living in Orkney means that I have endless opportunities to try to capture the magic of the Ring Of Brodgar Stone Circle and Henge, part of The Heart of Neolithic Orkney World Heritage Site. An excursion to this spectacular site, which lies only 8 miles away from my home, one calm and mild evening in April 2010, proved particularly eventful. My idea was to illuminate the stones and capture some star trails. Having meticulously decided on my location in the surrounding ditch, I set my camera up to produce continuous 30 second exposures using a locked cable release, and then headed off for a walk around the stones. In the clear night air I noticed the beginnings of a light mist forming in the ditch; and, returning to my camera after about 40 minutes, I found that condensation had formed on the lens, rendering my images useless. I had no idea how many usable exposures I would have, but decided to go ahead with the last 2 exposures anyway, with the stones illuminated by torchlight. Just at this point an aurora glow appeared to the north and, despite my excitement, I managed to make another 30 second exposure to capture this transitory phenomenon. I ended up with 20 usable images out of a total of 45; and these, together with the illuminated stones and the aurora glow, produced a blended image which I was happy with. If you look closely you will notice small gaps in each individual star trail and this is due to the camera’s long exposure noise reduction software which produces one dark image after each 30 sec exposure. Although I had intended to create much longer star trails, the unexpected aurora more than compensated for this.